Volume 26 of the Gabriel Wells Definitive Edition of Mark Twain's works is What Is Man? And Other Essays. The sixteen stories in this collection are the same as those found in the first edition of the book issued by Harper and Brothers in 1917 in their Uniform Library edition. The title page of Volume 26 lists an Appreciation by Brander Matthews and an Introduction by Albert Bigelow Paine. Other Gabriel Wells volumes do not feature the names of contributors on the title pages. However, Brander Matthews did not contribute an Appreciation for this volume -- the title page represents an uncorrected editorial error. Title page announcing an Appreciation by Brander Matthews which is nonexistent. AMONG the books of his summer reading at at Quarry Farm, as far back as 1874, there was a copy of Lecky's History of European Morals, a volume that made a deep impression upon Mark Twain and exerted no small influence upon his intellectual life. In it he found warrant for his own philosophies and stimulation to still wider fields of thought. One point in particular would seem to have made a special appeal to him: Lecky refers to those who have undertaken to prove that all our morality is a product of experience, that a desire to attain happiness and to avoid pain is the only possible motive to action, the reason, and the only reason, why we should perform virtuous deeds being "that on the whole such a course will bring us the greatest amount of happiness." In full agreement, Mark Twain paused at this point to write along the margin, "Sound and true." Probably the idea was not new to him, but it would seem now to have become more permanently fixed in his mind. At all events, it remained with him during the rest of his life and we find him airing it here and there in literary forms. Six years later he made an address to the Monday Evening Literary Club of Hartford, entitled "What is Happiness?" based on the proposition that every human action, bad or good, is the result of a selfish impulse, a desire for the mind's greater content. As time went on he developed, or adopted, a second conclusion -- that man is no more than an irresponsible machine, incapable of a single thought or action outside of his promptings and capabilities. With more or less success reconciling this philosophy with his earlier doctrine -- "driving the two in double harness," as it were -- he now set himself to write what he declared to be his "Gospel," a series of chapters that should place his thought squarely before the world. An old friend, Doctor Parker of Hartford, visiting him in Austria in 1898, heard him read chapters of the new undertaking, and, while not in full agreement, was a good deal impressed. The manuscript would seem to have reached considerable proportions at this time, in fact a sort of conclusion. It was not, however, offered for publication. 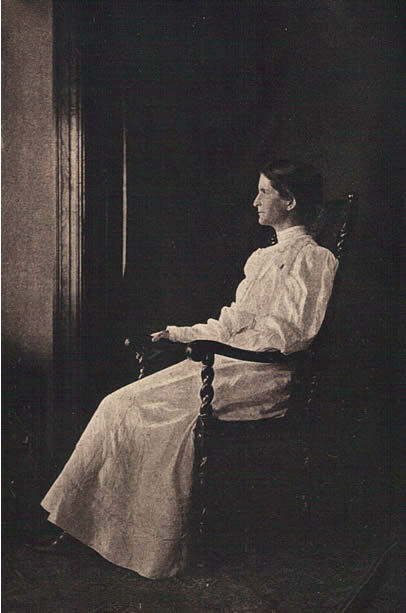 Samuel Clemens's wife, who from the days of their courtship had been his literary counselor, objected to the "Gospel" as blighting to all human effort and spiritual growth. In a letter to W. D. Howells, the following year, Clemens refers to "my Bible, which Mrs. Clemens loathes and shudders over and will not listen to the last half, nor allow me to print any part of it." So the "Gospel" lay in seclusion for a full seven years longer, though occasionally its author exposed it to some visiting friend, and now and then added a new chapter. He now decided to print it anonymously under the title, What is Man? -- two hundred and fifty copies, to be privately distributed to friends. Mrs. Clemens was no longer alive and in any case would doubtless have consented to this plan. Mark Twain arranged with Frank Doubleday, of the firm of Doubleday, Page & Co., to take charge of the matter, and the De Vinne Press was engaged to do the work. The book was copyrighted in the name of J. W. Bothwell, the superintendent of the De Vinne Company, and the small edition was handsomely printed on hand-made paper. Copies of the little book were sent to newspaper reviewers, none of whom would seem to have suspected its authorship. It created no particular stir, being generally characterized as clever, even brilliant, in its presentation of lines of thought no longer startlingly new. 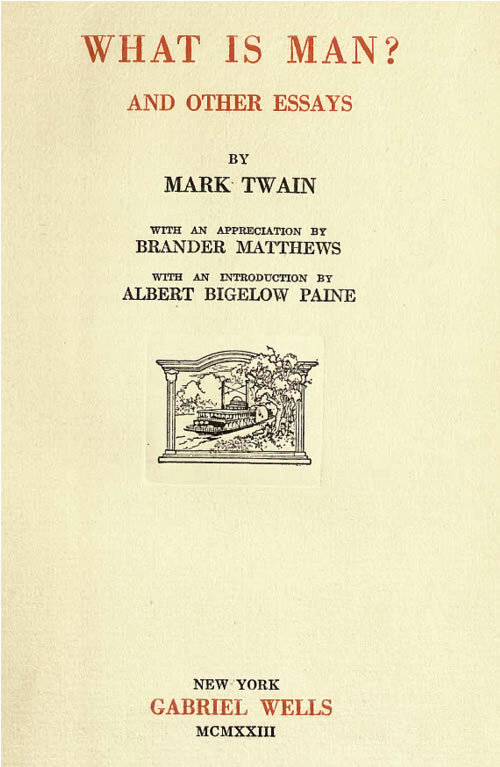 When in the course of time it leaked out that Mark Twain was its author, the little volume was in sudden demand, though less because of its contents than on account of its scarcity. Collectors were willing to pay fancy prices for it, and, there being no English copyright, an edition was brought out in London. Since then it has been regularly included with Mark Twain's published works. What is Man? is an interesting document, but it is not likely to take rank among Mark Twain's greater achievements. For one thing, it seems to weaken in its final conclusions. Whether it was to modify the blighting effects contemplated by Mrs. Clemens, -- to ease his conscience in that direction -- that he offered his "Admonition" we do not know; but that it did not strengthen his case is certain. "Diligently train your ideals upward and still upward toward a summit where you will find your chiefest pleasure in conduct which, while contenting you, will be sure to confer benefits upon your neighbor and the community." "Yes, like the sky; you can't break through anywhere." Like the "Eureka" of Edgar Poe, What Is Man? was more regarded by its author than by the reader, and survives as a curiosity rather than as a guide to human thoughts, or as a basis of enduring fame. While your wonderful words are warm in my mind yet, I want to tell you what you know already: that you never wrote anything greater, finer, than that turning-point paper of yours. "The Death of Jean," written at the end of the year, brought Mark Twain's literary labors to a close. There is not in the English language a more exquisite example of pure elegiac composition. He regarded it as the conclusion of that long series of reminiscent chapters which he called his Autobiography, but it was his wish that it should first be published separately. The final article in this volume, "Is Shakespeare Dead?" originally issued as a small book, was likewise written as a part of the Autobiography. As a piece of special pleading, it offered opportunity for the exercise of one of its author's finest gifts. Mark Twain's gifts were many -- his mind was alive to a multitude of interests. The present volume in its great variety fairly represents his limitless range. The Gabriel Wells Definitive Edition of What Is Man? And Other Essays features four full-page photographs, including one of Jean Clemens which is rarely seen. In addition, there are numerous sketches and illustrations by Clemens -- most prominently in "How To Make History Dates Stick" -- which are not listed in the illustrations list. Uncredited photo of Jean Clemens accompanies "The Death of Jean"